Sometimes we all get unwanted eyebags and it seems that no matter how much coverage we put on, there seems to be no escape from hiding them. The appearance of eye bags can make people look fatigue and older than they really are. Although eye bags can be hereditary there are some ways to minimize eye bags. Here are a few different approaches to prevent them. 1. Get enough shut eye. 2. Avoid high consumption of water and sodium before bed time. Water retention and salt inake incline the chances of causing your skin to swell. 3. Try to refrain from devouring cafffine, alcohol and cold drinks especially prior to sleeping. It's ideal to drink warm or room temperature liquids before bedtime. 1. 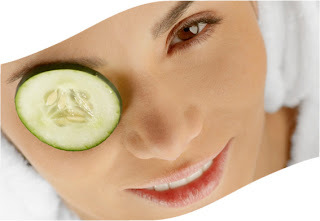 The most common remedy to depuff undereye swelling is placing a slice of cucumber over each eye. You could also try slices of potatoes. 2. Place two teaspoons into the freezer for at least 30 minutes. Remove them from the freezer and place each teaspoon onto each eyelid for about 5 to 10 minutes or until the swelling has lessened. 3. Soak cotton balls into a cup of ice cold water. Squeeze out the water and while lying flat place one cotton ball over each eye. Cucumber really is effective! My wife have been using this kind of remedy ever since. I love your post glad to found your blog. I've tried it once but it seem to have little or no effect. But thanks anyway it's a great tip! Wow I've never heard of the cotton ball thing, that I'll have to try.